This blog was originally posted on the IIEP Learning Portal here. Through evidence from both developed and developing nations, we know that high-quality teaching is central in creating an educational environment that supports learning for all. We also know that there are multiple interventions and policies that, when effectively and coherently implemented, can nurture an effective teaching force. However, for practitioners, some of the empirical evidence can seem far-removed from the political realities and implementation constraints they face on the ground. Valuable insights into the practice of designing, implementing, evaluating, and scaling interventions often emerge through strategic trial and error, through the “doing”. Ideally, practitioners not only design and implement their model, but also continuously and systematically iterate, refine, and adapt it based on what they are learning throughout the process. A learning approach at this level creates shortened feedback loops that can yield important actionable insights, not just for practitioners, but also for donors and policymakers seeking to realize the vision of quality, inclusive, and coherent education systems. As part of an effort to foster innovations that may catalyze systemic changes in secondary education, the Partnership to Strengthen Innovation and Practice in Secondary Education(PSIPSE) has supported NGO partners in testing approaches to cultivating high-quality teaching in order to improve learning outcomes, primarily in East Africa and India. Employing a unique application of the Systems Approach for Better Education Results (SABER) Teacher framework, we’ve distilled practical insights and lessons learned through the implementation of eight of these programs that can help NGOs design, implement, evaluate, and scale efforts to provide in-service teacher training. In-service teacher training programs need to acknowledge the challenges teachers face in adopting new pedagogical approaches. One NGO, Educate!, designed a pedagogical approach that is easy for teachers to remember and facilitated improvisation in the classroom: “build-practice-present.” This approach not only adapted to what they heard from teachers – “no one really used lesson plans in real life” – it also enabled expansion of the model as it did not become diluted when cascaded to multiple schools and was easily understood by government officials. Training programs also need to allow enough time for teachers to fully understand the new pedagogies, to test them in class, and – through trial and error – to master their use. One NGO, the Global e-Schools and Communities Initiative (GESCI), built an ambitious three-stage model to facilitate ICT- infused teaching but rolled it out too quickly – over three terms. Given the steep learning curve to become technologically literate, teachers got stuck early in the multistep change process. GESCI has since stretched the rollout of the new approach over three years. For innovations to move from the margins and permeate the educational system, they must be cost-effective and in line with government resources. One NGO, STIR Education, that is particularly vigilant about costs used the government’s per-pupil spending of $200 per year as a yardstick and designed an intervention that costs about 1 percent of that amount ($2). This approach enabled them to make a strong business case to the government. Forging strong ties with teacher colleges and universities that offer pre-service training could help create a virtuous feedback loop – whereby the NGOs’ in-service trainings benefit from the expertise of academics, and the academics benefit from the infusion of new practices and practical experiences of the NGOs testing approaches on the ground. PSIPSE NGOs found that engaging government stakeholders in the design process can set the stage for potential scale-up. By leveraging field visits and classroom observations and being open with the government about mistakes, they were able to increase government stakeholders’ confidence in new, potentially radical shifts in the way teachers are trained. The teaching force is heterogenous: some teachers enter the profession in response to a strong vocation, whereas others make a sound career choice given viable alternatives. The experiences of PSIPSE NGOs suggest that driving improvements in teaching quality at the system level requires using a mix of strategies to motivate both sets of teachers. The study delves into these and other insights that can support practitioners, donors, and policymakers alike in designing, implementing, and scaling efforts to train, motivate, and support teachers. These insights are also an important reminder that strategic learning and collaboration – not only with students and teachers but also with actors at various levels of the system – are key to realizing the vision of coherent education systems dedicated to improving the educational outcomes and life chances for all children. Learning from the experiences of those who are testing different approaches (but often facing with similar challenges) builds key scaffolding that allows us all to design, iterate, and collaborate from a more informed vantage point. 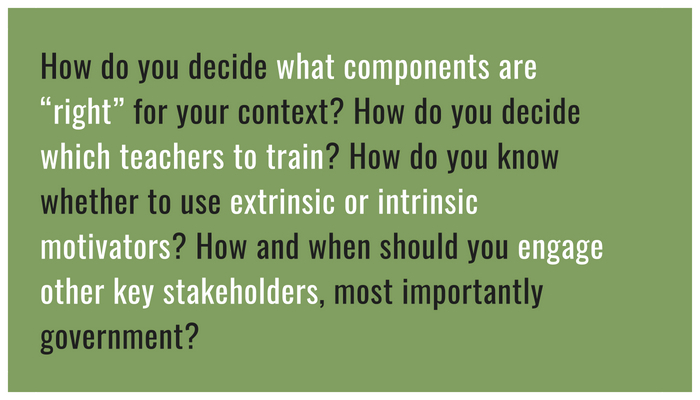 This blog was adapted from a brief outlining 10 tips for designing scalable interventions for cultivating quality teaching written by Clemencia Cosentino and Swetha Sridharan of Mathematica Policy Research. Read the brief here and the full study here.